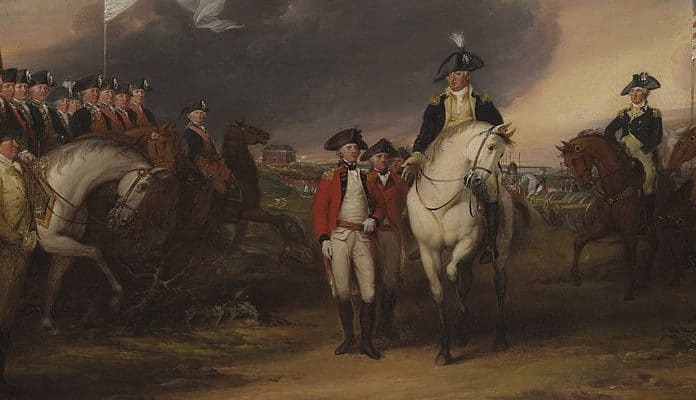 The American Revolutionary War is remembered as citizen-soldiers battling the professional troops of Great Britain and its German mercenary allies in the woods, fields, and towns of the British colonies. American militias sought to secure the frontiers while a professional army was slowly enlisted, trained, and deployed. While these events are true, they are but a small part of the story of the Revolutionary War. With the involvement of France and Spain, the Revolutionary War became a global war, as the European powers fought to expand their colonial empires. The war was fought in the Indian subcontinent, the Caribbean, the North Atlantic, and in the Mediterranean. There were American led raids in the British Isles. A joint Franco-Spanish expedition was prepared to invade Great Britain, posing its greatest threat of invasion since the days of the Spanish Armada. Gibraltar was besieged, threatening British trade in the Mediterranean. British and French troops fought in India. The British sugar colonies in the Caribbean, a source of wealth for the empire greater than the colonies on the North American continent, were attacked by French expeditions. The Dutch joined the war against Great Britain in 1780, further straining George III’s dwindling resources, and British overseas trade. It was a world war. Here are some of the events which placed England in a position from which it was forced to accept the independence of its 13 North American colonies as the United States of America. 1. American sailors raided Whitehaven in England. The intrepid Scottish born sailor John Paul Jones knew the harbor of Whitehaven well, having sailed from that British port at the beginning of his career at sea. Despite difficulties with his crew, particularly among the officers whom he considered motivated by financial gain rather than duty, Jones led a raid against the port on April 23, 1778, hoping to burn the nearly 200 vessels moored or at anchor there. The assault, led by Jones and consisting of fifteen men in two boats, did not go as planned. When the lanterns ran low on fuel, Jones dispatched a party to break into a public house to obtain alcohol for fuel. The sailors availed themselves of the opportunity to have a few drinks, delaying the operation. Although the raid managed to set fire to a large collier, by dawn the town was aroused, fire engines pumped water onto the flames, and Jones and his men, some of them clearly drunk, were forced to make a prudent withdrawal. The retreat was protected from cannon fire because some of Jones’s men had spiked the town’s guns, preventing them from being fired. Although the raid inflicted little damage, it did bring British attention to the fact that the war was not limited to America, and their own coastal towns and villages were subject to surprise attack by the rebels. British newspapers depicted Jones as a pirate, and coastal towns were forced to increase their defenses.